The ONLY place to find a Things to do in Austin resource for Auto Enthusiasts is on MOTOR Austin! Finally, a "Things to do in Austin" list for Auto Enthusiasts! Experience adrenaline pumping aerobatics flying in a biplane over downtown Austin, travel back in time with a train ride or experience the world class Circuit of the Americas race track! These are just some of fun things you can experience from our list of things to do in Austin for auto enthusiasts. Whether you are visiting Austin or have recently moved to the Austin area and are looking for something fun to do on the weekend, you can find something fun to do on this list. 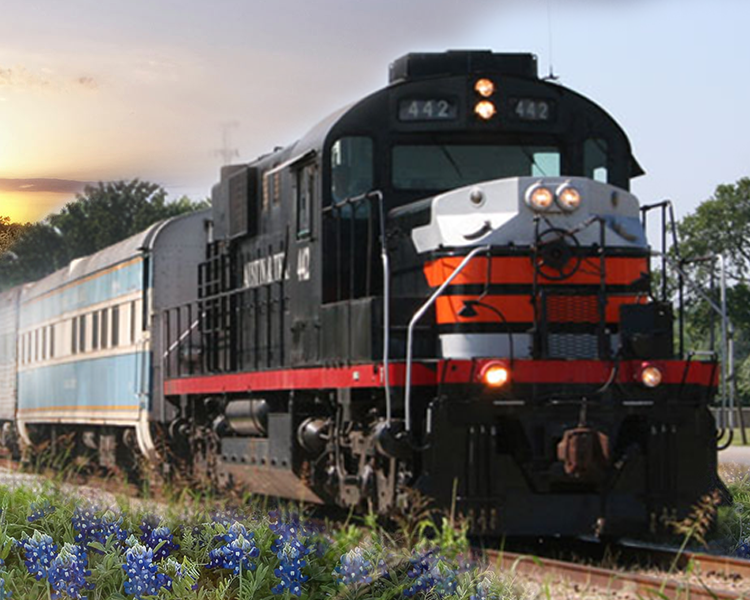 Take a scenic ride in a train with the Austin Steam Train association. Although the website is called Austin Steam Train, the steam train has been undergoing major restoration since 1999. The train they currently use is an Alco Diesel 442. It's a diesel-electric RSD-15 six-axle road-switcher built by the American Locomotive Company in 1960. This type of train has the nickname of alligator due to its long and low nose. The steam train is known as the Southern Pacific 786 and it has quite an interesting background. The engine had a long life pulling freight through Texas and Louisiana from 1916 to 1956. After it was retired from service it was donated to the city of Austin. It was put on display near Fourth and Trinity streets. In 1989, after many years of decay, it was leased to the Austin Steam Train Association. It was restored enough to run for a few years but it eventually developed major issues that would require it to be completely restored. Most of their rides depart from Cedar Park and either go to Burnett or Bertram. The Cedar Park to Burnett ride is approximately 2 hours each way. The shorter trip goes to Bertram (home to the annual Oatmeal Festival) where there is a short 15 minute stop to visit of the 1912 train station (a relocated Orange Grove station). They have several themed rides available that include plays and even a wine tasting trip. Visit the Austin Steam Train Association website for details on train ride packages and the latest information. The Circuit of The Americas (COTA) is a world-class racing and entertainment facility designed specifically for Formula 1 racing. They hosted their first Formula 1 race in 2012. If you would like to experience the Circuit of Americas but aren't in Austin during a race event you still have options! 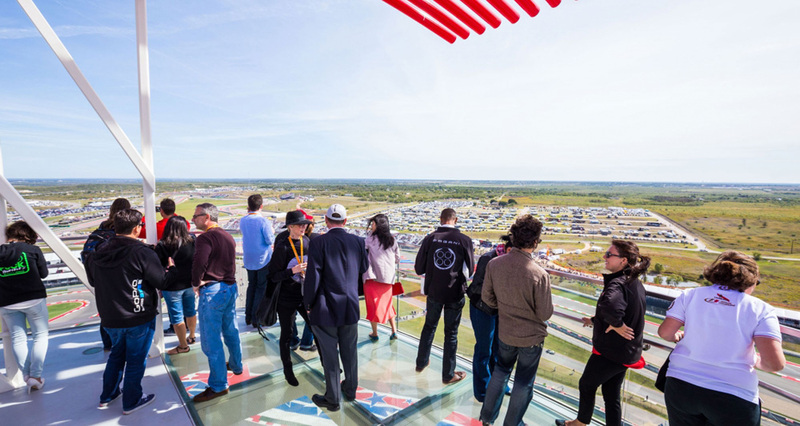 The Circuit of Americas offers tours of the facilities during the weekend and can accomodate group tours during the week with advanced notice. The Greetings from Austin mural one of Austin's most beloved examples of outdoor artwork. The mural was painted on the side of Roadhouse Relics in 1998 by Todd Sanders and his friend Rory Skagen. The goal was to brighten up the neighborhood with the beautiful mural but it quickly became an iconic backdrop for many a photo opportunity for both visitors and locals. Over the years the colors began to fade. Todd Sanders and Rory Skagen worked with community leader Troy Madres to raise funds in order to restore the mural. The restoration project took one month and the completed version was unveiled November 23, 2013. Not only is the mural a great backdrop for taking photos with your family and friends but also your favorite vehicle (hint hint). Keep in mind that the mural is next to a public street and there could be cars parked in front of it. If you are lucky enough to park your car in front of it and get a shot please be careful. Don't get run over. 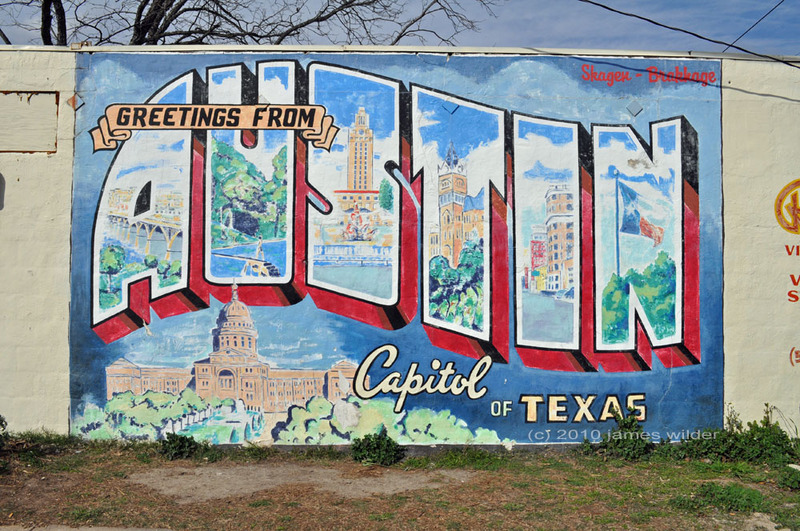 The Greetings from Austin mural location address. Looking for something fun and exciting to do on four wheels in Austin without getting a ticket? K1 Speed is a world-class indoor go kart racing facility located in north Austin. 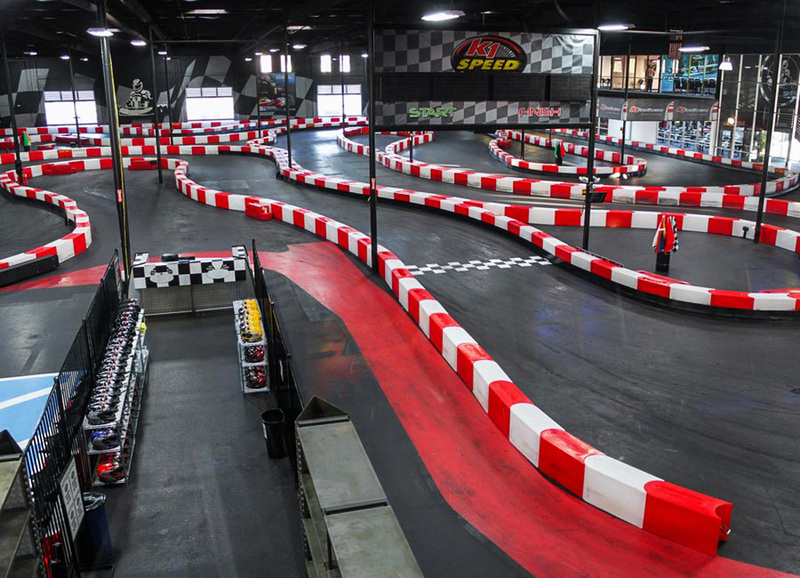 Their indoor kart tracks are among the largest in the nation! An atmosphere that is if not as exciting as the on-track racing action. Corner after corner of dizzying G-forces. Speeds of nearly 45mph on the track. Museum-worthy collection of racing memorabilia, including race suits from famous drivers, race cars, autographed paraphernalia, and amazing art work. Great for individules, couples, families and tream building exercises! The Blue Starlite is a "mini urban" drive-in movie theater that focuses on indie films, art house, cult, Gen X/Y, childhood favorites, and drive-in classics. They call it a mini urban drive-in because it is located in the city (as opposed to a 10 acre field) and they limit the number of cars per movie showing to somewhere between 30 to 50 vehicles. They also have a walk-in section, and they strongly suggest you bring a FM radio and chairs! Now for the really cool part. You can rent the whole drive-in and have a movie night for two! You can also request a specific movie. A more practical scenario would be a group rental. A great idea for car clubs to add a little variety to your meetup! The Blue Starlite mini urban drive-in movie theater was the brainchild of Austin resident Josh Frank. Josh is a writer, producer, director and composer. So, why would a writer, producer, director and composer start a drive-in move theater? Quite by accident, it turns out. Sometime back in 2010, Josh wanted to celebrate the six month anniversary of his relationship with his girlfriend. He decided to set up a drive-in just for two on some property he had access to. During the set up process Josh's friends became interested in attending. Next thing you know, it turned in to a business. The original drive-in "opened" in 2010 at an art co-op/studio at 2326 E. Cesar Chavez. He later opened a second larger location on 1001 E. Sixth. As the drive-in grew (and the lease expired), Josh scouted for another location. He eventually made a deal with Austin Studios and had the grand opening at the current location on July 4, 2012. Curious about what a real hot rod shop looks like? We recommend a visit to the Austin Speed Shop. The Austin Speed Shop is a custom automotive fabricating shop that specializes in building 1963 and older traditional style Hot Rod and Custom cars from start to finish. The Austin Speed Shop, originally called South Austin Speed Shop, was founded in 2005 by a partnership of three hot rod enthusiasts and entrepreneurs. Most people have never set foot in a hot rod shop. They're usually located in industrial areas or backyard workshops. There are very few that really welcome visits from the curious. Although the Austin Speed Shop is located in a semi-industrial area, they are very welcoming to visitors that are interested in learning more about the custom car and hot rod world. Even if you're not there to start a project you can always buy some apparel, view the projects they are currently working on and take a few photos. This meetup started in 2009 and is still going today! The gathering consists mainly of hotrods, street rods, muscle cars and classic cars belonging to the club members and visitors. The meetup is every Saturday evening from about 6pm to 10pm, year-round (although if its extremely cold and/or raining don't expect anyone to be there). The Gearhead car club usually has representatives there and you can buy Gearhead club apparel to show your support. They also sponsor an annual open car show at Cabela's in the Fall. No burnouts or alcohol as this meetup is in the Cabelas parking lot. Cars and Coffee Austin is a monthly automotive celebration that meets at The Oasis on Lake Travis, the "Sunset Capital of Texas." 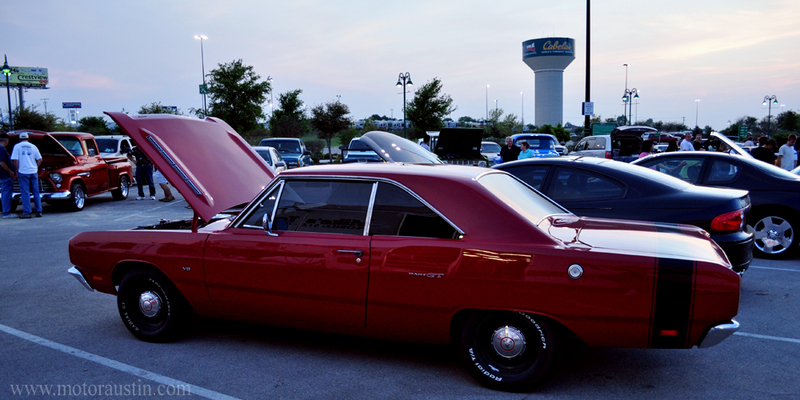 You will typically find more late model muscle cars, sports cars and exotics at this meetup. 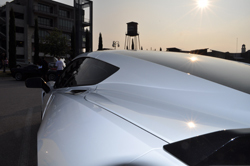 Cars and Coffee is held there each month on the second Sunday from 10 am to 1 pm. These are just some of things to do in Austin that would be of interest to auto enthusiasts. Check out our Resources page for more ideas! Article photo "Austin from Congress Bridge" by Daveydickler (Own work) [CC BY-SA 3.0 (creativecommons.org/licenses/by-sa/3.0)], via Wikimedia Commons.